Need To Sell Gift Cards Online? Here Are 4 Ways To Do It! Published June 28, 2017 By Anna T. This post may contain affiliate links. Regardless, I only recommend sites I've researched and/or used and trust. Sometimes when you get a gift card as a present, you would actually prefer to just have the cash instead. Maybe the card is for a store that has nothing you want or isn't near your local area, or maybe you simply just need the money more than you need anything from the store. Luckily for you, it's super easy to sell gift cards online! In this post, I've provided a quick list of places where you can turn gift cards you don't want into cash. Another bonus is that the sites linked below also sell gift cards at reduced prices. So, if you're planning to buy anyone else a gift card, you may want to browse the listings here to see what discounts you can get. This site claims to give you an offer on your unwanted gift cards in less than ten seconds. You can choose to either input the codes from your cards online or mail them in. The payout is a little higher for mailed-in cards, but you get paid faster if you do it electronically. After you get your quote, you can choose from Paypal, direct deposit, mailed check, or receive a gift card from another merchant. Most people receive payment within 1-2 days or order approval, according to the seller's FAQ. Go here to check out CardCash. Lots of merchants available. They pay in mailed check, Paypal deposit, or Moneygram. You can do electronic or mailed redemption although this is another site that does require a credit card number on file if you do an electronic redemption in order to prevent fraud. You cannot sell gift cards here with values less than $20. Go here to check out GiftCards.com. This is another site that's very careful about fraud. You cannot sell here unless you can provide a valid credit card, photo ID, and a cell phone that can receive text messages. Also, you can't sell any cards with a value under $15 and they don't do electronic submissions, just mail-ins. They only pay by check unless you are a bulk seller who does business with them frequently, and for that they will do Paypal. Their cash back rates are all over the place, but it does look like most are well over 50 percent. Go here to check out Gift Card Zen. If you prefer to do most things via smartphone apps, Raise is one you can download that makes it possible to either buy gift cards or sell your unwanted ones. You set the price for your cards, and you will get paid once they sell. Raise will accept gift cards from any store or brand. Once you have submitted your card and the selling price, it will be featured in their marketplace. Go here to learn more about Raise. And that wraps up the list! I'm sure there are other online marketplaces that make it possible to sell gift cards, but these appear to be some of the most popular options out there. Good luck if you try any of these! 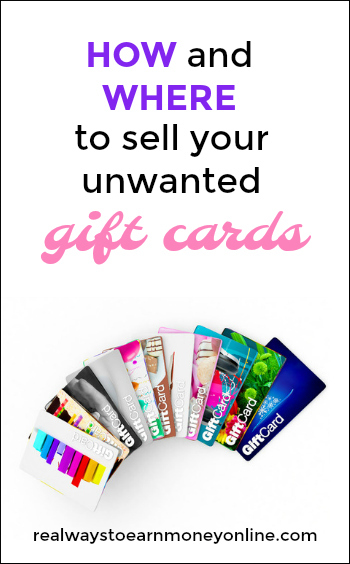 I also have another post with ideas of what to sell online if you're looking to get rid of more than just gift cards. Post originally published November 18, 2013. Updated and re-published June 28, 2017.